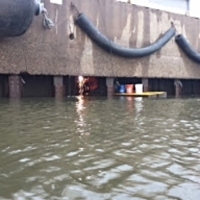 Commerce Construction was contracted to repair steel sheet pile cells. 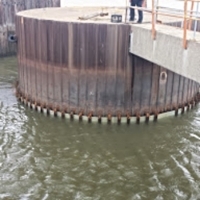 Welded framework was installed onto the existing sheet piles. 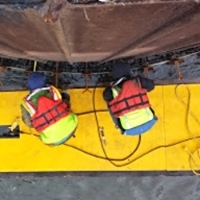 Commerce Construction developed a proprietary framework methodology which entailed the use of welded brackets with removable components, rebar reinforcement, 5000 psi grout, and interlocking fiberglass reinforced plastic form panels. 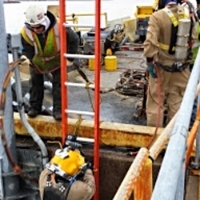 In total, 2900 linear feet of repair work was completed. 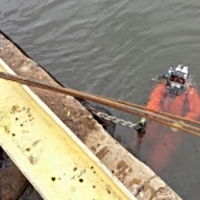 All existing sheet piles were repaired in the “wet” by construction divers. 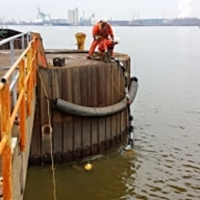 The purpose of the sheet pile repairs was to help prevent future corrosion and to help extend the useful life of the cells by another 20 years. 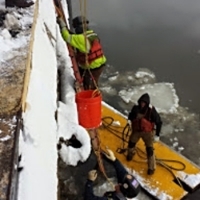 Commerce Construction worked closely each day with the terminal tenant to coordinate work with shipping activities and US Customs activities, along with gantry crane positioning.